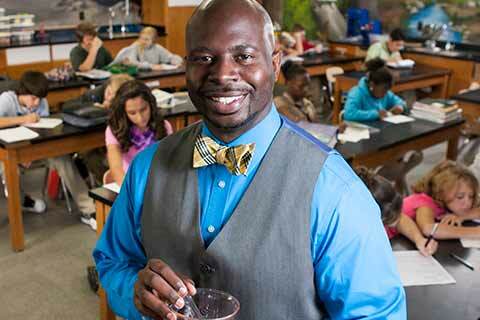 This Master of Education program prepares teachers to become certified gifted specialists. Samford University’s Master of Science in Education (M.S.E.) in Gifted Education is designed for teachers who feel called to teach gifted and talented students or plan to work with students, their families, and teachers as a certified gifted specialist for grades P-12. Samford’s M.S.E. in Gifted Education has been awarded National Recognition of Specialized Professional Associations through CAEP, the accrediting body for university schools of education. This program is the only graduate program in Alabama that has received this prestigious approval. Gifted specialists understand the uniqueness and the characteristics of gifted learners. Our program graduates are prepared to develop appropriate learning opportunities that aid gifted students in reaching their full potential. The program is delivered in a blended format, ideal for educators working full-time. Blended courses offer the same quality education as students receive in a face-to-face classroom, including strong relationships with classmates and faculty, small class sizes and a blend of theoretical concepts with practical, hands-on experiences. Courses are delivered by award-winning faculty who are invested in preparing the next generation of teacher leaders. The program was developed to help certified teachers continue their education, take on leadership roles, and conduct powerful practitioner research that has the ability to have a direct impact on their practice and the practice of others. The M.S.E. in Gifted Education is designed for those who have completed a bachelor’s degree in elementary, secondary or special education but desire to gain knowledge and understanding of pedagogical concepts to meet the needs of gifted students in the P-12 classroom. The program can be completed in just 18 months through a blended delivery format. Candidates are expected to attend an on-campus orientation at the beginning of the program at which time a program overview, introduction to the online learning management system and course expectations will be presented. During each of the courses in the gifted teaching field, there will be both on-campus and online (virtual) class meetings. Accommodations may be made for individuals who are unable to attend on-campus class meetings. At the end of the program, all candidates are expected to attend the on-campus class meeting for presentations of their portfolios and program debriefing. The curriculum requirement for the program is 30 credit hours. Students must have a 3.25 or higher cumulative GPA at Orlean Beeson School of Education to graduate. Please view our full list of completion requirements. Official Transcript showing bachelor’s degree. Transcripts are considered official only when they bear the issuing institution’s seal and arrive with the seal intact. Transcripts can be sent electronically to kbgilrea@samford.edu or by mail. Official GRE or MAT Scores. Applicants should request for GRE or MAT scores to be sent to Samford University from the testing agency. Waived if applicant has already completed a graduate degree from an accredited university. Writing Sample: highlight one problem facing education today. If you have a desire to help gifted and talented students reach their full potential, this program is for you. This program will help you enhance your skills and your career. As gifted educators, we believe it is our responsibility to find the unique gifts of talented students and give them the opportunities they need to thrive. By completing the program, you will become well-versed in the theories, research and strategies that best serve gifted students. If you have a Class B teaching license in elementary, secondary or special education but desire advanced knowledge in gifted education, you could be a candidate for the master’s in gifted education program. Candidates currently holding a master of science degree in a teaching field from an accredited college/university and Class A certification in an education field from the Alabama State Department of Education may be eligible for the 18-hour certification program rather than the full degree program. Upon a successful completion of six prescribed courses (18 semester hours) the candidate will be eligible for the Class A Certificate in Gifted Education.